If you let your Volvo workshop change oil in your Volvo according to specified intervals, you don’t need to know anything about oil. Besides that, it might be interesting to know that Volvo and Castrol have developed a new oil quality, fully synthetic oil especially adapted for the new Volvo engines. The new oil complies with the requirements governing the new service intervals of 30,000 km or 1 year. The extended intervals will be introduced for five-cylinder petrol engines from model year 2005 in a number of European countries. Contact your Volvo workshop for further details. Read on to learn more about engine oil and the difference between synthetic oil and traditional oil. 1. Reduce friction between the moving parts in the engine. By reducing friction the oil also help minimise wear, heat and noise in the engine. 2. Remove heat from the engine to the cooling system. 3. Keep the engine clean on the inside by dissolving dirt and deposits. The oil transports the dirt to the oil filter where it is contained. 4. Create a seal between pistons and the cylinder walls. This prevents combustion gases from reaching the engine oil. 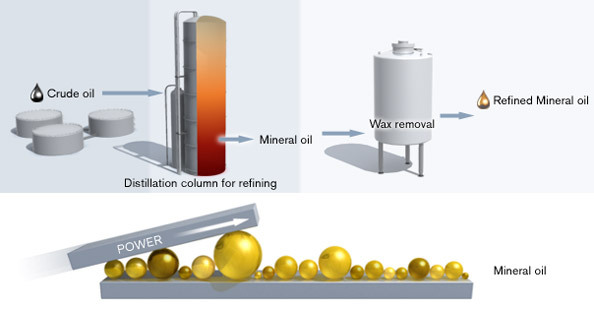 In a traditional oil, the molecules varies in size and composition and react very differently to wear, which gives rise to poor performance over time. The good old traditional oil. Traditional oil, or mineral oil, is what it sounds, oil from deep down in the earths crust. The crude oil is refined in a process that removes unwanted impurities such as phosphorus, sulphur, and metals. However, conventional refinement will not remove all unwanted chemicals that can affect the size and structural arrangement of the molecules. As a result the molecule chains may break and degrade the ability of the oil film to perform all of the critical tasks within an engine. Modern car engines are built with extreme tolerances and the traditional oil simply cannot deliver the lubrication they need. In a fully synthetic oil, the molecules have the same size and composition which makes the oil stable over time. One might get the idea that synthetic oil can be manufactured without any crude oil, but that is not the case. Synthetic oil is indeed created from refined crude oil, but according to a different manufacturing process which makes it possible to manipulate the oil on molecule level. The process makes it possible to design the characteristics of the fully synthetic oil, and to maintain the same characteristics over time. The synthetic oil contains no impurities and all molecules have the same size. Among other things, this means that the friction within the oil itself is lower. This improves operating economy, lower fuel consumption and reduces the impact on the environment. Increases the working life of the engine. Better engine protection when cold starting in temperatures below +20°C. Wear reducing properties. More stable during temperature changes. Better compatibility with seals and packing. longer, e.g. extended service interval.